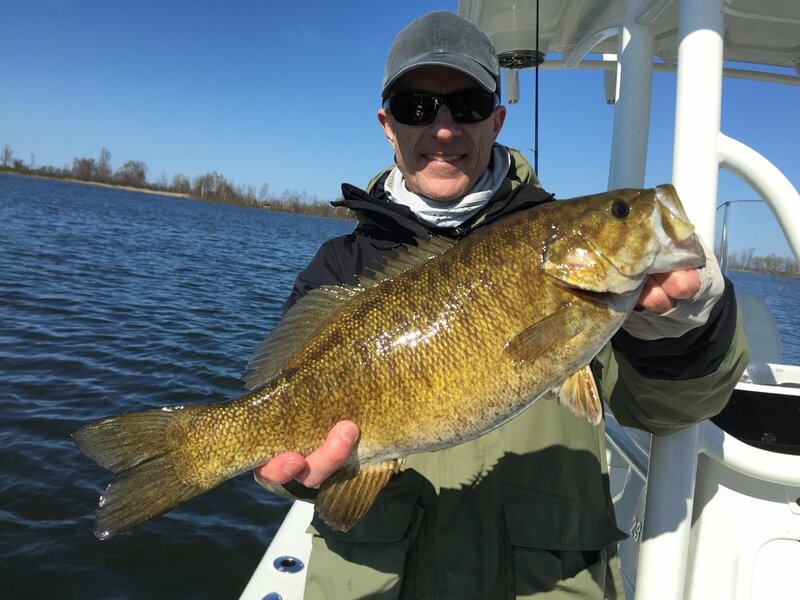 Well, we're on the eve of the 2018 WI general fishing opener and, there's not too much to report on! The Bay still has ice and many inland lakes have ice on them as of today. There are a few small lakes here and there that have opened up, but not many. The ice is really going fast now though with the warm temps we've been having. The good news? There's LOTS of open water on the big lake out in the Islands and out of Saxon Harbor. Trollers have reported great fishing so far with lots of Cohos again this year. The water is cold out there, raging in the mid-30s in most areas. There's some off colored water to deal with too, but it hasn't seemed to bother the fish too much. Steelhead fishing on the local tributaries is picking up too now that the run off has sort of slowed a little bit. Still some high and dirty water to deal with, but there are fresh fish showing up daily right now. It might not be the classic fishing opener we all hope for, but there's plenty of fishing to be had. Winter just doesn't want to give up this year. Everybody is getting anxious to get in the boat and do some fishing, but it will be a little while up here yet. Things can change in a hurry on the big lake, so don't give up hope just yet. In the meantime, there's lots of fishing to be had right now. On the lake, the fishing pressure has been light out on the Bay, but anglers are reporting good catches of Perch, Smelt, Splake and a few nice Pike. Fishing around the rivermouths has been productive too with some nice Steelhead staging up and a few big browns hanging out as well. The Lake Superior Tributaries are open and although it's a little early for good fishing in many of them, the Brule is consistent with overwinter fish being caught. Low and slow is the key this time of year over there. Can't beat an egg pattern and small stonefly combo under an indicator. We've got a great selection of locally tied X-Legs that will do the job. In the meantime, it's a great time of year to go through your gear and make sure everything is in shape for when that ice lets go! Well, we're still very much in winter mode up here which is great news for you die hard ice fishermen. Anglers are reporting great fishing for Lakers and many guys have been on a hot Burbot bite lately with some very nice fish being landed. Drop a dead smelt on the bottom or bang the bottom with a heavy spoon to get bit by these guys. Cohos are being caught as well, right under the ice on tip ups rigged with a shiner. There has been some good action around the rivermouths too, with the warmer days being a little better as a little run off gets the fish moving in and out of the dirty water. The Lake Superior tributaries open up soon as well, so it's a good time to get geared up for spring Steelhead fishing. The Brule should be in great shape and the pre run off fishing will be good. Get out there and take advantage of these great late ice conditions! Dave Gellatly and Luke Kavajecz present Ashland Mayor Deb Lewis with a donation from the Roger Lapenter Chequamegon Bay Fund for the Ore Dock Redevelopment. As part of the Roger Lapenter Chequamegon Bay Fund, one of our long term goals is to continue the awareness of the varied resources throughout Chequamegon Bay. The Ashland Ore Dock redevelopment plan is going to create a very unique experience for local and non-local people and give them a chance to access the waters of Chequamegon Bay. Ashland has great fishing, but sometimes it's hard to access without a boat but the new Ore Dock redevelopment is going to change this in a big way. The support of the Roger Lapenter Chequamegon Bay Fund has been overwhelming and we're very happy to start using the support of the fund for projects that will make Chequamegon Bay and the Ashland area a better place to live and visit.